The ladies are gonna rock the house on the LES. That's right folks, LRock the Party Bookin g Presents: Women That Rock NYC. 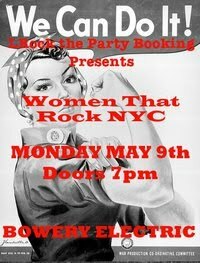 On Monday, May 9, a group of talented rockin' ladies with take the stage at The Bowery Electric. Doors are at 7PM and it will cost you $10 ($8 if you RSVP). One of my favorite rockin' ladies, Lisa Bianco will be there. She's debuting her new band, Lou Petto on drums and Kenny Aaronson on bass! Check out the full details below.